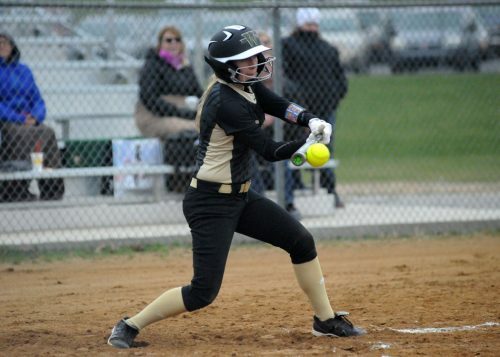 SYRACUSE – Only the wind coming off the hill at the Wawasee softball complex kept Meghan Fretz’s homers from leaving town. 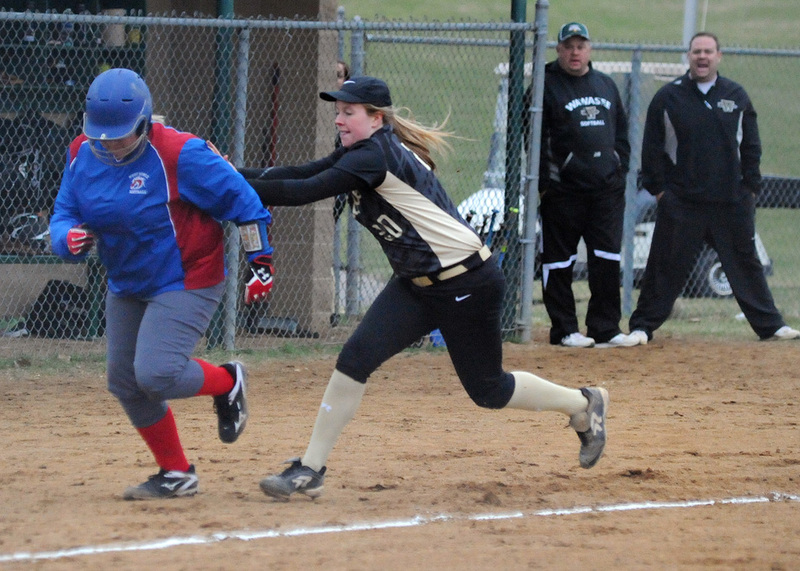 Fretz crushed a pair of tape measure shots in the Lady Warriors’ 12-0, five-inning win over West Noble Tuesday night. Fretz drove in eight runs in all, two in the first inning then came up with two runners on in both the third and fourth innings and launched a pair of moon shots. The first homer in the third went out to left center giving Wawasee a 5-0 lead, then the second a ringer to left in the fourth, putting Wawasee up 9-0. Kayla White centers up a base hit for the Lady Warriors. Fretz, who had just one hit in her first two games, was 2-3 with the eight RBIs. She also made her presence known in the circle, allowing just three hits and striking out seven. West Noble only threatened twice in the game, leaving a pair of runners on in the second after Fretz got a groundout to end the threat, then in the fourth when a quality throw home picked off another runner to end a minor threat. Fretz’s damage came with the tablesetters in front of her doing their jobs. Ale Brito got on base twice, scoring two runs, Kayla White had two hits and two runs scored, and Madie Wilson was 3-3 with three runs scored. Faith Swihart was also 3-3 with a run, GraceAnne Kerlin had two hits and an RBI, and Leah deSomer came off the bench to add a two-run single. Ale Brito comes home for a run for Wawasee. “What I’m seeing now in game three is that the jitters are finally gone, they are starting to understand what we’re about in the program and they are buying into what the coaching staff is selling. It’s piece by piece,” Barger said. 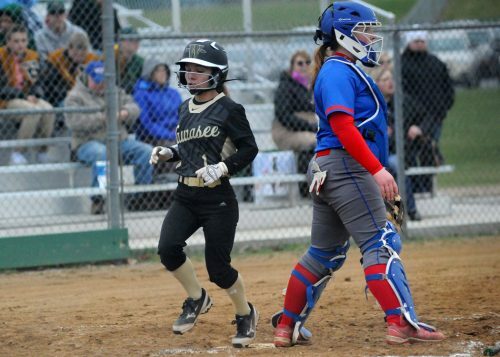 Wawasee touched up West Noble starter Ashley Strombeck for 16 hits in four innings. 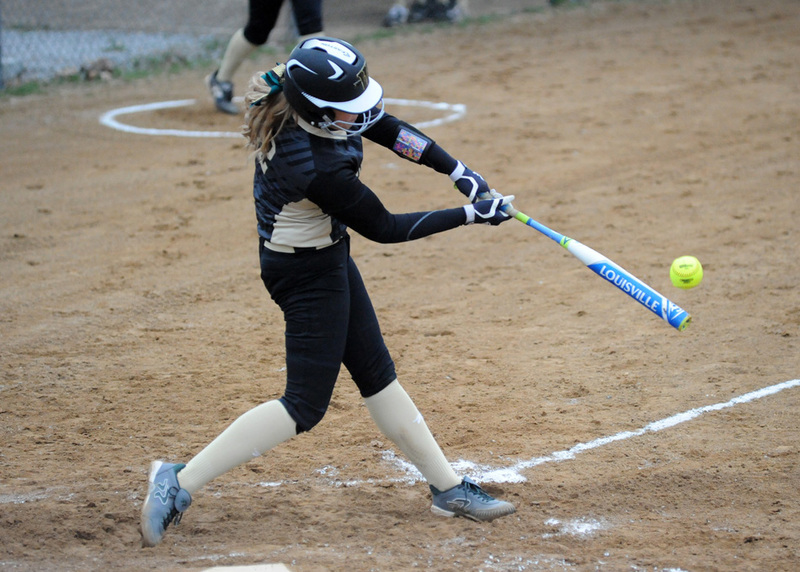 Angela Gross reached base twice for the Chargers, doubling and getting hit by a pitch. The Lady Warriors move to 3-0 on the season with a big matchup Thursday at Elkhart Central right before Spring Break. The Wawasee JV visited West Noble and came away with an 11-0 win. Rhian Galloway and Grace Allen each had two hits and Ciandra Ervin drove in a pair for the Lady Warriors in its first win of the season. Wawasee’s Hannah Haines tags out West Noble’s Audrey Fulford after a rundown in the fourth inning.